American president and lawyer who held the office as the 44th President of the United States for two terms from 2008. On 21 Jan 2013, President Barack Obama gave his second Inaugural Address at the United States Capitol. The topics in the speech were wide-ranging, including the usual references to the Constitution, what makes America exceptional and patriotism. He then talked about the nation's challenges, including wars, education, work skills, income inequality, health care and more. Science Quotes by Barack Obama. Barack Obama - Context of the “Deny the overwhelming judgement of science” - with medium image (500 x 350 px). Barack Obama - Context of the “Deny the overwhelming judgement of science” - with large image (800 x 600 px). 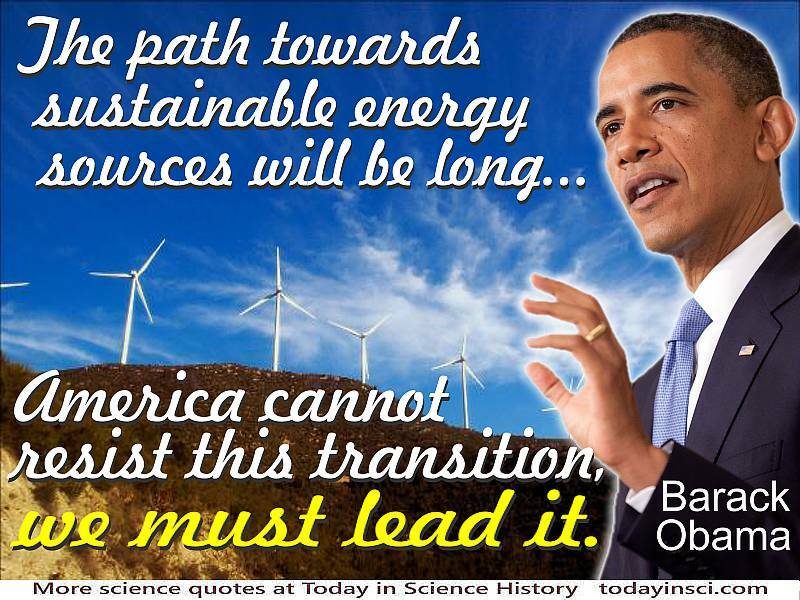 Barack Obama - Context of the “Sustainable energy … America … must lead” - with medium image (500 x 350 px). Nature bears long with those who wrong her. She is patient under abuse. But when abuse has gone too far, when the time of reckoning finally comes, she is equally slow to be appeased and to turn away her wrath. (1882) -- Nathaniel Egleston, who was writing then about deforestation, but speaks equally well about the danger of climate change today.